Thanks to new treatment options, Dr. Robert Dorin and Dr. Robert True are finding much more success in treating FPHL. At True & Dorin, we combine four aspects to treat FPHL. The doctors combine twice-daily use of 5-percent Minoxidil (Rogaine), low-level laser light therapy, nutritional support and restorative injections. 5-percent Minoxidil has just received approval from the U.S. Food & Drug Administration. Previously, only 2-percent was approved for women. Studies have shown that more concentration is superior. 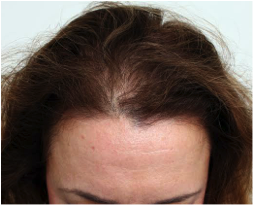 The main effect of the daily Minoxidil applications is to control further worsening of FPHL. Some patients will also experience some re-growth of hair after 5-6 months of daily use. 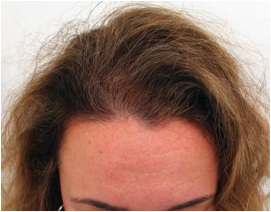 Low-level laser light therapy is applied to the scalp and has now been proven in several studies to reverse the reduction in the hair shaft that occurs with FPHL. Using low-level laser light therapy helps hair shafts regain their original diameter. There are many devices that deliver low-level laser light therapy like laser combs and brushes that can be used at home. You can also use hood devices that are available in-office. At True & Dorin, we find that laser caps are the most effective. Laser caps are affordable and and deliver the most scalp coverage. The cap is simply worn 30 minutes every other day. It is powered by a rechargeable battery pack clipped to the belt and can be worn underneath any kind of hat. Patients can work around the house or office or even go out in public while their treatments are in process. While the main effect is thickening of individual hairs, studies also show that for some patients there is also an increase in hair counts. This is maintenance therapy that must be continued indefinitely. We always do a nutritional screen on our patient and recommend appropriate nutritional supplements. One of the most common problems contributing to worsening of FPHL is Vitamin D deficiency. Many people simple don’t know they have it, and identifying and correcting it helps to keep the hair loss in check. The fourth and perhaps most important component of our approach to FPHL is platelet-rich plasma injections to the scalp, also know as PRP/Acell. PRP is now used in many fields of medicine and surgery for tissue and wound healing. PRP is harvested from the patient’s own blood. Blood is drawn and processed in a special device and a suspension containing platelets is extracted. This extract contains a high concentration of natural healing factors, but it also contains factors that have been demonstrated to stimulate hair follicles to reactivate resulting in the re-growth of hair. PRP is combined with Acell to further increase the re-growth. Acell is derived from porcine bladder and is also now used as a wound-healing agent in other fields of medicine. For our patients we inject PRP combined with Acell into the balding scalp. Injections are typically given 6-12 months apart. Results appear in 3-6 months. While each of these four approaches helps female pattern hair loss on their own, it is the combination of using all of these approaches that produces the best results. In addition to this medical therapy, we can also do highly successful hair transplant surgery when indicated. All in all, there is truly new hope for women who are experiencing genetic hair loss. To see before and after pictures of work performed by Dr. True and Dr. Dorin, click here.